Pronounced ‘two-four’, Stirling 24 (STRL 24) is a 4WD appliance with 2,600 l of water. Its primary function is rural fire fighting. The appliance is fitted with two fire-fighting pumps. The main pump is a Darley 1.5AGE driven by a Kubota D722 liquid cooled motor. The second pump is a PTO driven Ultra High Pressure Foam Pro Turbo Stream Pump, capable of pressures up to 7,700 kPa. It is fitted with crew protection systems including a cabin deluge system which flows water over the cabin, and an in-cab breathing system that delivers fresh air to fire fighters in the event of a burnover. The Hino Kestrel 24 24 served Stirling for 19 years, from 1993 until 2012. 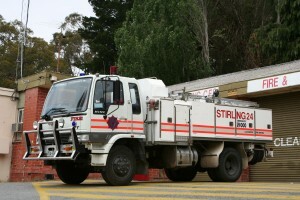 During that time it responded to thousands of fires, and went on several deployments around South Australia and interstate. 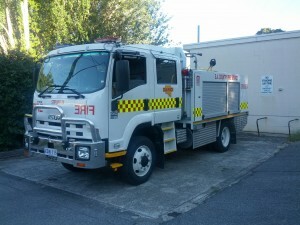 The appliance was built by Moore Engineering in Murray Bridge, and was fitted with a 1480lpm Gaam Mk 300 pump driven by a Hatz 2L40C diesel engine. The appliances was retired in December 2012 due to mechanical problems.